PM Narendra Modi’s visit to Kerala was supposed to be a celebratory meeting. But women below the age of 50 did enter Sabarimala during the pilgrimage season, making a celebration of their supposedly successful agitation redundant. 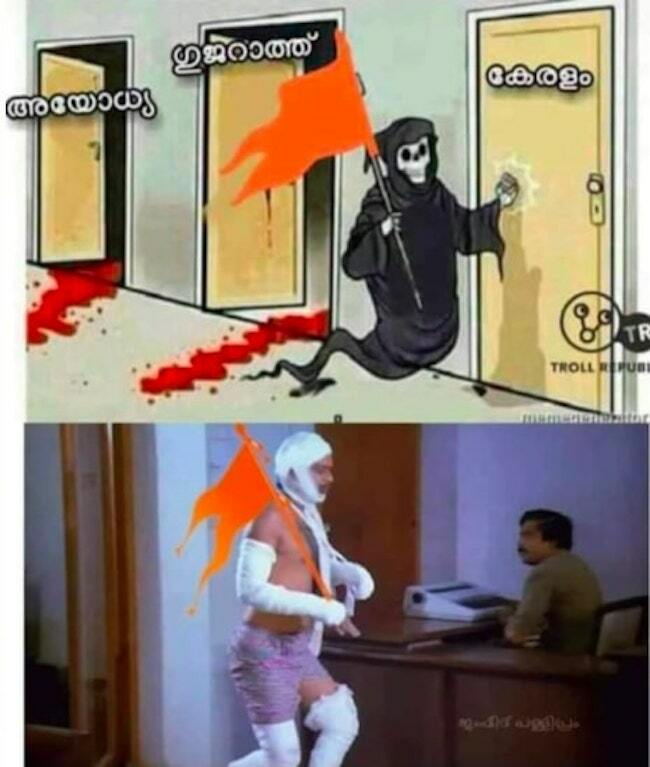 The spectre of communalism appears, carrying a Sangh Parivar flag, and throws open the doors of Ayodhya and Gujarat, leaving trails of blood behind, both times. It then knocks on the doors of Kerala, which remain firmly closed. The spectre of communalism runs away, limping with a fractured arm and leg, for its agenda has failed summarily in the state. This was a popular meme that appeared a day after violence erupted in the state when it came to be known that two women, Bindu and Kanakadurga, both under the age of 50, had successfully worshipped at Sabarimala temple on January 2. Despite the immediate violence precipitated by this event, normalcy was restored in Kerala within a day or two. For the BJP, which – as revealed in a leaked audio recording of its state president PS Sreedharan Pillai addressing youth wing members – viewed the controversy around women’s entry to Sabarimala as a “golden opportunity” to win over Kerala, the situation has become an anti-climax. In fact, the party had even planned to celebrate ‘Vijay Divas’ (Victory Day) to mark the ‘success’ of its agitation after the Makaravilakku (a major annual festival of the temple which falls in the middle of January). They wanted to bring Narendra Modi to the state to mark their victory. But Bindu and Kanakadurga’s entry into the temple has made a celebration of their supposedly successful agitation redundant. But PM Narendra Modi visited the state, nevertheless. He inaugurated a bypass and addressed the public in Kollam district on Tuesday. Modi disappointed eager party workers gathered at the bypass inauguration by not mentioning Sabarimala at all in his speech. Soon after, though, he addressed a public meeting of the National Democratic Front Alliance; and while there, he decided it was time to blow the poll bugle, by painting the failure of his party’s strategy on Sabarimala as a damning act of the LDF government in the state. “The entire nation has been talking about Sabarimala. The conduct of Kerala’s LDF govt on Sabarimala issue will go down in history as one of the most shameful acts by any party or government. We knew that communists don’t respect Indian history, culture and spirituality. But no one imagined they would have such hatred,” he said. Although Narendra Modi’s comments were made in an NDA meeting, Left leaders in Kerala say his speech was not becoming of a Prime Minister. While PM Modi in his speech evoked religion and spirituality, critics of the BJP in Kerala say that Sabarimala, for them, has been nothing but politics. “How many recordings do you want us to show to prove that the BJP was in favour of the Supreme Court’s women’s entry judgment in the initial days?” asked Thomas Isaac. “They have decided to use the most opportunistic tactics since, because they think that will get them more votes,” he added. But while the Prime Minister’s speech has been discussed widely, for BJP party workers in Kerala, Modi’s poll bugle has come as a fresh lease of life. Prathi Lal, a BJP worker, said he was overwhelmed by the number of people who gathered for the meeting on Tuesday. “It was a much-needed visit. After all, for a party which tries to build up base in a state, consistent effort is needed. The PM’s visit should be viewed in that perspective,” he said. “The feeling I got is that, the BJP also has someone to counter state politicians with strongly-worded comments. The PM’s visit gives the feeling that the party also has a leader,” said Suresh Babu, another BJP worker.